This article will explain our best practices around tracking Landing Pages. The main reason to track Landing Pages is to analyze performance of your marketing campaigns across different landing page topics, designs, and versions. You get the idea… To keep things clean we recommend choosing a single, generic page name to track all your landing pages. Here at Segment, we use "landing" for our generic landing page name. It doesn’t get any simpler than that! Now’s the fun part. Using a generic page name means you’ll rely on a rich library of properties to analyze your pages. 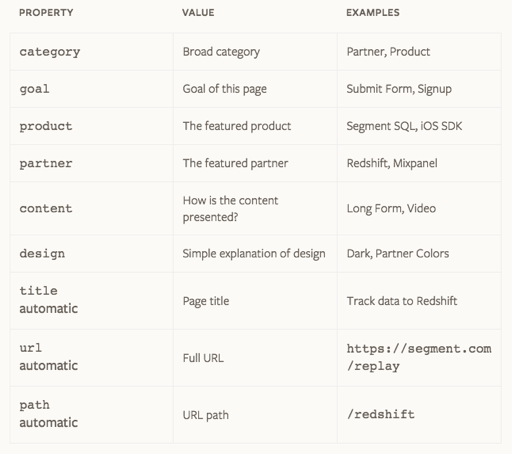 NOTE: The Segment page call automatically collects title, url, path, and referrer as properties. Notice that all the properties are things that describe the page itself. There’s no need to describe all the traffic sources that send visitors to the page. That data should be collected through the use of UTM parameters or by looking at the page referrer in your analytics tools. You don’t need to include the whole library with every page call, but we recommend limiting your design and marketing team to use only a short list of properties so you don’t end up with random, meaningless properties. To track your landing pages all you need to do is replace the default, empty call to page from your Segment snippet with a named page call. You’ll also need to include some of the optional properties from the table above for your event analysis to be useful. The last step is to see what your data looks like in some analytics tools. NOTE: Make sure "Track Named Pages" is enabled for your event tracking tool (you can find it in your integration settings under the Advanced Options tab). That way Segment will generate an event each time a page call is made that includes a name argument (the page name is "Landing" in this case). If you’re using Segment Warehouses you can analyze your data using one of our BI partner tools like Looker or Mode for complete SQL access to this rich data about your landing pages.